Here are some reviews the cd garnered on different little blogs that I had never heard of before. And I don’t think anybody else has heard of them either. What’s funny is when writers attribute artists of whom I have never heard as influences. The Bowie comparisons are nice. You might just want to buy the cd here and make up your own mind. 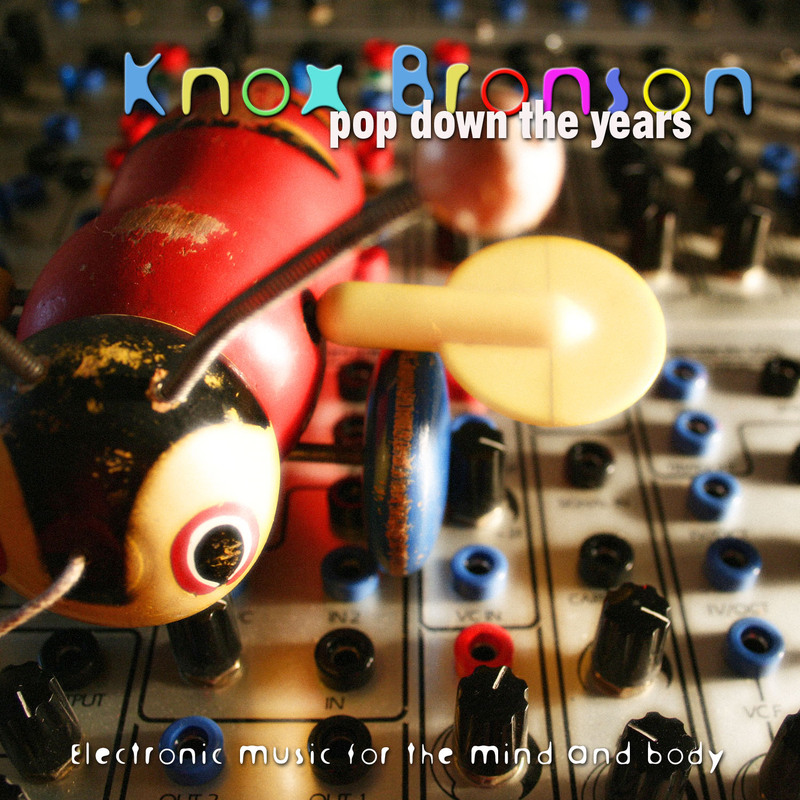 “Hey Little Girl” is the first track on Knox Bronson’s “Pop Down The Years”, and it immediately distinguishes Bronson as someone that boldly forges a new and unique form of music. The track ties together traditional rock music with an airy approach to electronic music, crafting something in “Hey Little Girl” that will immediately and positively impact listeners. “Old Man Cold Man” follows up “Hey Little Girl”, and presents a shift in musical style that allows Bronson to expand his repertoire over the course of the following seven tracks. “Old Man Cold Man” links together a cold, industrial-influenced instrumentation with a haunting set of vocals that will undoubtedly stick with listeners long after the track wraps up. “3 Seconds Before Maia Smiled” links together a traditional, Eastern type of instrumentation with a much more modern type of sequencing: Bronson’s vocals on “3 Seconds” approach that of “China Girl”-era David Bowie. The chorus of “3 Seconds” will be familiar to fans of acts like 45 Grave, Sisters of Mercy, and Bauhaus. Bronson is able to create “3 Seconds” in such a way that, while influenced by the Romantic and gothic movements of the eighties, has still much to say to listeners today. The disc does not lose steam as it rolls on; the vocal heavy “Celeste” continues to show listeners that Bronson’s palette is limitless. The track itself has a heavy fifties influence, with the acoustic guitar that lends the backdrop to the track playing upon Iggy Pop as much as it does current lo-fi and indie rock acts. Listeners should understand that, by the end of “Pop Down The Years”, that Knox Bronson is creating an album that is as eclectic as the average listener. There are firm roots in each of the disc’s nine cuts in a myriad of different decades, genres, styles, and approaches to music: it is through this rich buffet presented listeners that Bronson creates a stellar album. I know that I will be keeping my ear firmly to the ground when it comes to rumblings about Bronson’s next album or live dates, and it is my suggestion that you pick up “Pop Down The Years”. Equal parts Kraftwerk, the better parts of Roedelius, Metro, Daevid Allen, a bit of the Buggles, Woo, and Enoidian nursery weirdness—even some Beach Boys!—Knox Bronson has created a prog-pop confection of very attractive atmospheres alternating between stark and lush, innocent and knowing, 70s and 00s, perhaps even chamber and MTV. Sections of this are mindful of Verity’s Digital Planet, a lost prog gem, but there’s also a small trace of lightened-up Kevin Ayers, though Bronson’s vocal work is completely untutored and oft a tad too forward in the sonic field, best when he pushes through a Vocoder (catch Stay and Hey Little Earthgirl). In fact, the singing’s the only deficit in a collection otherwise boasting a Romantic approach swimming in Acadian pastorale and elliptically magnetic fields. Perhaps the most striking aspect of Pop Down is the availability of each cut for covers, for juicy permutations that could be crafted from such wide-open bases. This is Bronson’s first third release—which means the first two were never officially released—and shows predominantly Impressionist roots grafted into futuristic means but not yet fully realized, though very close and extremely promising. Prepare for a musical high. Knox Bronson’s Pop Down The Years is an experience unlike any other. With a voice comparable to David Bowie, English musician, actor, record producer and arranger, Bronson has fused melody, rhythm, organic style and electronic style together to produce brightly colored modern and classical pieces. Pop Down The Years starts with the simple up-beat electronic track, Hey Little Earthgirl that will brighten up any day. With a driving beat, Bronson puts his lyrical and electronic magic to work, accentuating the lyrics through a vocal distortion. The lyrics match the electronic style of song, “Hey little Earthgirl I think your fantastic, intergalactic, Hey little Earthgirl, electronic where I’m taking you its supersonic.” Be prepared to hum Hey Little Earthgirl for the rest of the day. Bronson continues to distort his Bowie-esque vocals in Old Man Cold Man which features a much slower and relaxing beat along with a mellow pop sound. Also notable is 3 Seconds Before Maia Smiled which begins with an interesting electronic, asian-sounding beat that slowly transforms into another relaxing mellow pop sound. Using electronics to set the mood, Bronson brings more energy to Bordertown then you’ll find on 90% of the other tracks as he sets the stage for a mid-album pick up. Taking a break from his Bowie-like vocals, Bronson distorts his vocals in a whole new way to create the unearthly electronic sound in Stay. Sit back and prepare to visit a far out place with one of the most relaxing, yet far out sounds you have ever heard. The almost six minute track is one you can put on and go about things while the mellow electronic sounds play in the background, or sit back and listen to the lyrics and unique style. Either way, Stay is one of hte more pleasurable listens on the album. Proving his songwriting, arrangements and use of electronics is nearly endless, the do-it-all Bronson’s Pop Down The Years is an nearly endless mixture of one-of-a-kind sounds. Ending with less reliance on the electronics, the album closes with its title track, a calming, enjoyable explanation for the title. If you find yourself in a bad mood, pop in Knox Bronson’s Pop Down The Years, sit back and maybe play a game or chat on your laptop, but in the end… just relax. Before you know it your blood pressure and pulse will lower and everything will somehow feel okay. And if that doesn’t work for you, put Pop Down the Years away and listen to something else for a while… then come back to it like I did. Chances are, Bronson’s unique sounds are bound to grow on you. Knox Bronson is a Bay Area-based singer-songwriter who has used this release as a way of revisiting the 60s and 70s and making a tribute to the old school way of composing and producing. More than that, he’s looking to re-invoke the days when music seemed like the doorway to all things right and beautiful. He has done all the programming work himself, written and arranged the songs and sung them too (with some help from chanteuse Angie Harnell…note to Knox, next time, give her a bit more space to strut her stuff). Sometimes, when an artist gives himself all the tasks, he loses sight of the goal and the album’s focus drifts. Not so here; Bronson keeps his inner eye on the ball and delivers a piece of work that harks back to good times of Donovan and the Moody Blues, but maintains a foot in the here and now. Bronson is the kind of guy who’s seen it, done it and even has the t-shirt, but gave it back. He is literate, mature and thoughtful and this comes through in spades in this release. He’s here to speak his truth in quiet, authoritative terms. Bronson has a voice that reminds one of David Bowie in his good years. He doesn’t have an especially melodious voice, but it is pleasant to listen to, authoritative and solid. The music and lyrics flow around our ears, drawing us into another place. The only cover song is “Celeste”, originally written by Donovan (and done better by Bronson), but we are treated to “Pop Down The Years”, an evocation of the days when the intellectual and the psychedelic could co-exist in the same song. Summary: Get this album. For mouldy oldies, this music is a throwback to the “good ol’ days”. To the young and hungry-for-the-new, this release will come as a revelation. The Bay Area’s Knox Bronson creates pop music by running away from pop music. Delving into influences that include 60’s pop, classical, jazz, blues and electronica, Bronson creates a musical stew that is different than anything you’ve heard before, and yet amazingly catching and close to the heart. Bronson writes according to the philosophy that all songs already exist, reaching out into a sort of musical super conscious to bring back bit by musical bit until some pure confection is completed. In this way Bronson creates music that stirs the lifeblood the way Rock N Roll did in the 1960’s; the way rap did in the 1980’s. Pure creation and pure music blend together to fuel Bronson’s first released album, Pop Down The Years. Bronson’s muse is true to the long line of tempo-setting pop/rock bands to come out the San Francisco Bay area. Bronson has this odd air about him that’s part Jim Morrison and part David Bowie, almost as if Ben Stein decided to sing. The result is a jarring listen as your mind tries to wrap itself around his unconventional sound. Pop Down The Years opens with Hey Little Earthgirl, an electronic ode to pop music that is quite catchy. The vocals are buried in effect and heavy synthesizer work, but the music is infectious and will have you tapping your toes. Old Man Cold Man has a stilted vocal style that isn’t monotone but suggests that sort of effect. Take Me Down has the same sort of Jim Morrison on downers affect to it. The style is interesting, but does begin to wear on the listener after a bit. Other songs of note are Bordertown, Celeste and Pop Down The Years. Knox Bronson is unusual. His depressive Jim Morrison style vocals leave little room for middle ground. You’re either going to fall in love with this record right away or you’ll dislike it on personal terms. The rub is that whatever you think of the delivery, Bronson is a fabulous lyricist. His story-based songs are poetic and masterfully told. Unfortunately the delivery does get in the way at times. Pop Down The Years is a unique creation that should help establish Bronson with sort of folks who like(d) The Cure, Depeche Mode and any of the other semi-depressed Brit bands of the 1980’s.